So-called "PVS" victim, testifies against her perp! BOSTON — A jury in Springfield, Mass., convicted a man on Wednesday in connection with a beating that left his stepdaughter with a severe brain injury that led to an end-of-life dispute. The stepfather, Jason Strickland, was convicted of five of the six assault and battery charges that stemmed from the September 2005 beating of the girl, Haleigh Poutre. 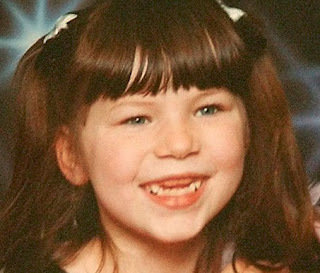 Haleigh, then 11, was left comatose and on life support with severe brain damage. The case drew national attention when the state sought to end life support after doctors determined that Haleigh was in a permanent vegetative state. Mr. Strickland, who had been charged, opposed the move. The Massachusetts Supreme Judicial Court backed the state’s decision, but Haleigh soon began improving. Now 14, she lives in a rehabilitation center, where she attends school. A video played at the trial showed her pointing at letters and feeding herself. Mr. Strickland and his wife, Holli, Haleigh’s biological aunt, were raising the girl and her sister in Westfield, Mass. Ms. Strickland died in what was apparently a murder-suicide with her grandmother days after charges were filed against the Stricklands. The verdict came hours after the jury had asked Judge Judd Carhart if a conviction required that Mr. Strickland was present during the beating that caused the brain injury or simply aware of it, Judge Carhart’s clerk said. Judge Carhart said jurors had to believe only that Mr. Strickland knew that leaving Haleigh with his wife posed a risk of injury. Mr. Strickland, 34, testified that he had never abused Haleigh. The girl had been treated many times for bruises and other injuries, but Mr. Strickland said he believed his wife’s claims that the injuries were self-inflicted. A baby sitter testified that she had seen Ms. Strickland push Haleigh down the stairs and hit her with a bat, and that she had seen Mr. Strickland hit Haleigh. Haleigh’s sister, Samantha, 12, who failed to identify Mr. Strickland in court, testified that she had seen the Stricklands push Haleigh down the stairs. Michelle Malkin has much more . . .
Ah...the miracles that can happen when we don't STARVE AND DEHYDRATED INNOCENT PEOPLE TO DEATH.